Offering the dual benefits of investment and insurance, Unit-Linked Insurance (ULIP) plans play a major role in financial planning. In addition to offering a life cover to the family of the person who has purchased, it acts as an investment mechanism for wealth creation. When you invest in a ULIP, a portion of the premium is allocated towards providing the life cover, while the rest is invested in different fund options. Equity Funds Medium to High Risk Invest in company stocks with the prime motive of capital appreciation. Income, Fixed Interest, and Bond Funds Medium Risk Money is invested in government securities, corporate bonds, and other fixed income instruments. Cash Funds (or money market funds) Low Risk Money is invested in bank deposits, cash, and other money market instruments. Balanced Funds Medium Risk Invest both in equity and fixed interest instruments. 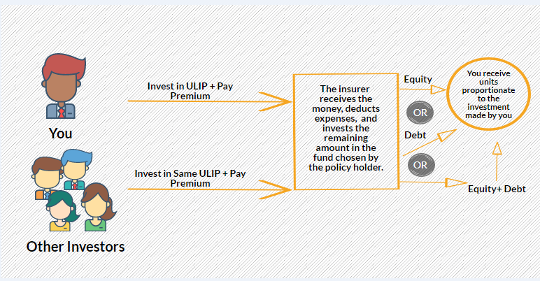 The insurance company pools money from all ULIP policyholders and invests the remaining amount (i.e., after deducting expenses and life cover amount) in the funds chosen by investors. Once the money is invested, the total corpus amount is divided into different ‘units’ with a face value. Then each investor is assigned ‘units’ in proportion to the invested amount. At any point in time, the value of each unit is called the Net Asset Value (NAV). Any increase or decrease in the value of underlying assets is also reflected in the NAV. The fund value represents your growing corpus by way of NAV. At maturity, the insurer pays the fund value. In the case of the untimely demise of the policyholder during the policy tenure, the higher of the sum assured, fund value or death benefit is paid. ULIP charges are levied by insurers by deducting the number of units. The premiums you would pay are subject to certain charges before they are invested in the fund chosen by you. These charges are deducted either monthly or yearly, as per your policy and its terms. Administration Charges A fee is levied for administrating the policy every month. Fund Management Charges These are charged towards managing the fund. Switch Charges As per your goal or market condition, you can switch between different funds. In a policy tenure, a fixed number of fixed switches are given and subsequent to this, each switch would attract charges. Surrender Charges These are levied for premature encashment of units. Mortality Charges Depending on the age and the coverage amount, these are levied towards providing a death cover to the policyholder. Premium Allocation Charges These are deducted upfront from the premium. Though it is always recommended to stay invested for a longer duration; one can make the partial withdrawals from ULIPs to meet any financial requirements without hampering the continuity of the plan. This withdrawal can be made any time after the completion of five policy years, and a limited number of free withdrawals are offered by insurers in a policy tenure. ULIPs also offers the flexibility of making additional investments through top-up. It means, the policyholder can invest the excess funds in the plan and reap the benefits of market conditions. ULIPS like ICICI Pru Guaranteed Wealth Protector offer the dual benefits of a capital guarantee and life cover. Though returns in ULIPs are market-oriented, with capital guaranteed feature, in any case, you will not get less than what you have invested. In addition to saving money, tax planning is an imperative part of financial planning. Not only your insurance premiums, in fact, not only death benefits paid under ULIPs along with maturity amount, but top-up investments are also tax-free under the Income Tax Act. Investing in a ULIP is the simple and easy way to enjoy the triple benefits of life cover, high returns and tax savings with ease to invest online. So, now when you understand the nitty-gritty of ULIPs, there is no point of holding yourself back.